In this December 24, 2008, file photo, shoppers pack into Tysons Corner Center, a mall in McLean, Virginia. U.S. retailers so far have announced they will shut 5,994 stores, while opening 2,641 in 2019. A separate report by data analytics firm Thasos found foot traffic dropping off at malls across the country in recent months. It’s only April, but already this year more store closures — nearly 6,000 — have been announced than in all of 2018. That surely isn’t helping mall owners. Foot traffic at some of the best shopping centers across the country peaked around August 2018 and has since started to fall, after rebounding for much of last year, according to a new report from data analytics firm Thasos, which uses more than 100 million mobile phones to track when consumers enter and leave certain trade areas. As retailers are now starting to talk about pulling back on discounting, this could be one reason why traffic is dropping at malls, he said, in addition to the fact that some purchases are moving online. Another issue is landlords have been hoping that offering shoppers new experiences would make it more exciting to go to the mall, but the early evidence isn’t showing a boost in activity. U.S. retailers so far have announced they will shut 5,994 stores, while opening 2,641, according to real estate tracking done by Coresight Research. That’s more locations slated to go dark than during last year. In 2018, there were 5,864 closures announced and 3,239 openings, Coresight said. The planned closures include more than 2,000 from Payless ShoeSource, which filed for bankruptcy, hundreds from clothing retailers like Gymboree, Charlotte Russe, Victoria’s Secret and Gap, and discount chain Fred’s. Meantime, chains like Aldi, Dollar Tree, Ollie’s Bargain Outlet, Five Below and Levi’s are planning to open more stores. On the closures front, however, the outlook doesn’t appear to be getting any better, Coresight predicts. That’s after 2017 was a record year for closures announced by U.S. retailers amounting to more than 8,000. Mall and shopping center owners, looking for ways to fill empty space, have in turn been forced to negotiate on lease terms with tenants and settle on cheaper rents. Then, landlords are turning to up-and-coming digitally native brands like shirt company Untuckit, glasses maker Warby Parker and mattress retailer Casper, which are opening hundreds of stores as a group across the country after finding success on the internet, to move into their properties. They’re hoping adding tenants that provide unique experiences, like Legoland, Crayola Experience and Dave & Busters, will lure shoppers from their homes and out to the mall. But Thasos’ Collins said that might not be going as planned. His firm found malls with so-called experiential tenants that aren’t just focused on selling products, like Apple, Italian food hall Eataly and Tesla, haven’t been drawing in extra traffic. Up until the final three months of 2018, indoor shopping malls with “experiential” tenants didn’t benefit from greater shopper traffic on a year-over-year basis when compared with indoor malls without any of those unique, nonapparel tenants, Thasos said. “This suggests [real estate investment trusts] are overpaying to bring in Tesla and Apple, and others, in order to drive foot traffic to the property,” Collins said. With more store closures likely on the horizon, consumers can expect to start seeing hotels, gyms, apartment complexes, more food halls and grocery stores at traditional malls, turning them into more like city centers. The new Hudson Yards mall, which opened in New York last month, is the perfect example of this mixed-use model. Mall owners are also experimenting with spaces that let young brands rotate in and out frequently, where they sign short-term leases and gain access to data on foot traffic and shopping patterns. Macerich, the third-largest mall owner in the nation, has a business called BrandBox that it’s rolling out at its centers across the U.S. 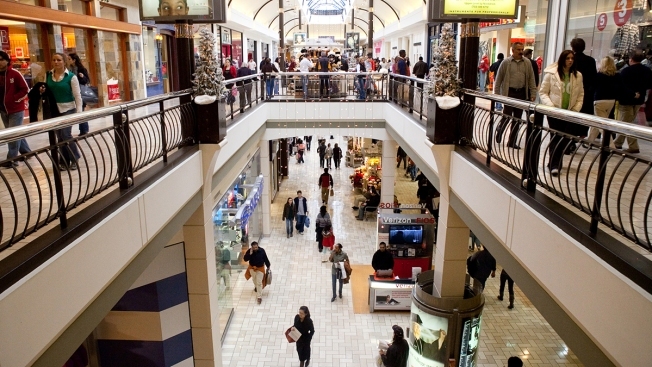 Mall owners including Simon, Brookfield, Taubman, Macerich, PREIT, CBL and Washington Prime are expected to report quarterly earnings in the coming weeks and will offer a glimpse at the current leasing environment and how they’re dealing with the latest wave of store closures.